When the mysterious daughter of Prester John appears on the doorstep of her father”s palace, she brings with her news of war in the West–the Crusades have begun, and the bodies of the faithful are washing up on the shores of Pentexore. Three narratives intertwine to tell the tale of the beginning of the end of the world: a younger, angrier Hagia, the blemmye-wife of John and Queen of Pentexore, who takes up arms with the rest of her nation to fight a war they barely understand, Vyala, a lion-philosopher entrusted with the care of the deformed and prophetic royal princess, and another John, John Mandeville, who in his many travels discovers the land of Pentexore–on the other side of the diamond wall meant to keep demons and monsters at bay. These three voices weave a story of death, faith, beauty, and power, dancing in the margins of true history, illuminating a place that never was. 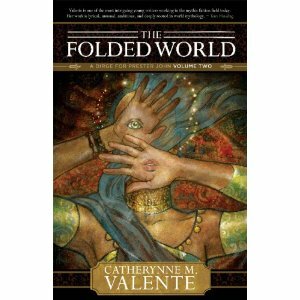 Catherynne M. Valente began September’s adventures in installments on the Web; the project won legions of fans and also the CultureGeek Best Web Fiction of the Decade award. She lives with her husband on an island off the coast of Maine. She has written many novels for adults and a few for children.